Hitting a home run in baseball is a big event during the regular season but when a player hits a home run in the World Series it's a really big event. These are the major league baseball players who have hit the most home runs in the World Series. Every major league player who has hit at least 10 home runs in the World Series is listed, and each one of these players is in the Baseball Hall of Fame. Also listed is how many World Series games and at bats each player had in their careers. 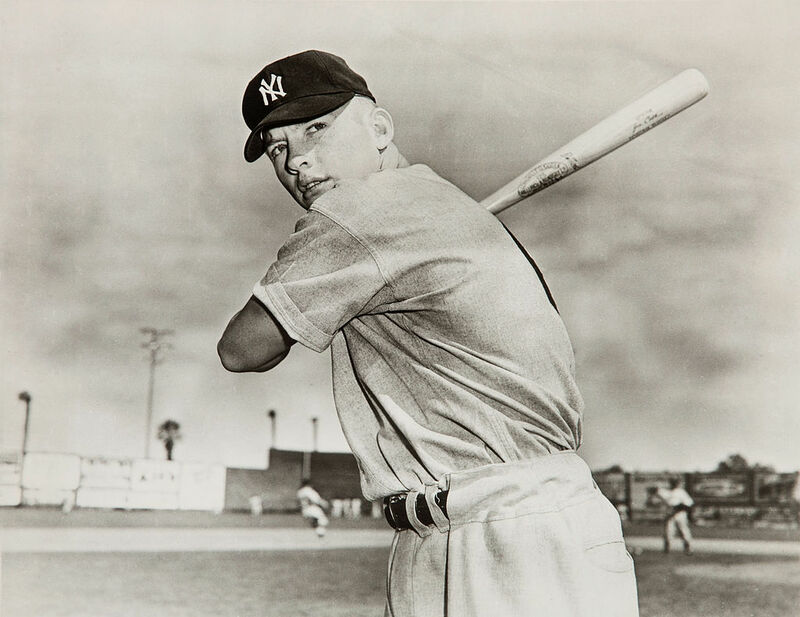 Mickey Mantle has more home runs in the World Series than any other player with 18. Mantle played in 12 World Series in his 18 year major league career, all with the New York Yankees. He had 230 official at bats in 65 World Series games so he hit a home run 7.8% of the time. The Yankees went 7-5 in the World Series Mickey Mantle played in from 1951-1964. Second on the list of most World Series home runs is the greatest hitter of all-time in the World Series, Babe Ruth with 15 HR's. The Babe had 129 official at bats in the World Series over 41 games so he hit a home run 11.6% of the time in Fall Classic play. Just an outstanding number. Babe Ruth played in 10 World Series in his 22 year career and his teams went 7-3. With the Boston Red Sox he went 3-0 from 1915-1918, and then went 4-3 with the New York Yankees from 1921-1932. Yogi Berra is the all-time leader in World Series games played with 75 and third all-time in home runs in the World Series with 12. Yogi had 259 official at bats over those 75 World Series games so he hit a home run 4.6% of the time. Yogi Berra played in an amazing 14 World Series in his 19 year career and the New York Yankees went 10-4 in the Fall Classics in which Yogi participated from 1947-1963. Duke Snider played in six World Series with the Brooklyn and Los Angeles Dodgers and hit 11 home runs in those World Series. Snider played in 36 games and had 133 official at bats in the World Series so he hit a home run 8.3% of the time. The Brooklyn Dodgers were 1-4 in the World Series Duke Snider played in, while the Los Angeles Dodgers won the 1959 series with Snider, who's major league career spanned 18 years. Reggie Jackson was named Mr. October for good reason as he hit 10 home runs in the World Series in just 116 at bats in 27 games over five World Series in his 21 year career. So Reggie hit a home run 8.6% of the time he had an official at bat in the Fall Classic, and, of course, he swatted three home runs in the decisive Game 6 of the 1977 World Series on three consecutive pitches he saw. An amazing feat unlikely to be duplicated any time soon. Reggie Jackson's teams were 4-1 in the Fall Classic, as he won both World Series he was in with the Oakland A's in 1973-74 and went 2-1 with the New York Yankees from 1977-1981. Reggie is also 4th on the list of Players With the Most Home Runs in the layoffs and World Series. In his 17 year major league baseball career, Lou Gehrig hit 10 home runs in the seven World Series he played in, all with the New York Yankees. In total, Lou Gehrig played in 34 World Series games and had 119 official at bats so he hit a home run 8.4% of the time he had an official at bat. The Yankees went 6-1 in the World Series the Iron Horse participated in. Lou Gehrig is thought to have died in in 1941 from ALS, also known as Lou Gehrig's disease, but recent evidence suggests he may have actually died from a condition brought on by repeated head injuries. Gehrig played college football at Columbia when the players only used leather helmets for protection and it is believed he was hit in the head more than once while playing baseball, so the theory is not that far-fetched. Gehrig's body was cremated so what really killed him will always remain a mystery.